In 1957 the school was opened department of folk instruments, which taught bandura accordion and domra, although when creating school class there harp, which led K. Lipinski. The department worked Honored Artist of Ukraine, prof. G. Kazakov, LA Bendersky (domra), Honored Artist of Ukraine, prof. LNMA them. Lysenko V. Gerasimenko (Bandura); Academician Peter’s Academy of Arts and Sciences (St. Petersburg), People’s Artist of Ukraine, prof., Rector of Donetsk Music Academy. C. Prokof’eva V. Vojvodina; Honored Artist of Ukraine, prof., Vice-rector LDK them. Lysenko A. Onufrienko; Honored Artist of Ukraine, prof. M. Oberyuhtin; J. Schneider, M. Rymarenko (akordeon- accordion). 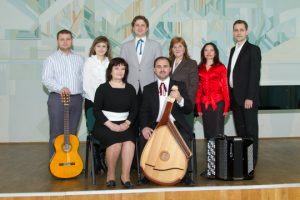 V. Gerasimenko led Bandura Ensemble. However, this department was closed in September 1964 Also students love this period is known in Ukraine and abroad performers and teachers: G. Menkush – People’s Artist of Ukraine; B. Gutsal – People’s Artist of Ukraine, winner of the National Prize. Shevchenko, director and conductor of the National Orchestra of Folk Instruments; R. Jwanski – People’s Artist of Ukraine; Y. Kovalchuk – Honored Artist of Ukraine, winner of the First Prize and the International Competition of Bayan Klingenthal (Germany), Assoc. Department of Folk Instruments LNMA them. Lysenko; B. Holubnychyy – Honored Artist of Russia, prof., Head. Department of Nizhny Novgorod Conservatory; P. Rachinsky – Honored Worker of Ukraine, as well known in Ukraine and abroad Skladman J., V. Polishchuk, GM Shatula, Zaraisky B., C. Onions, V. Cossack and others. Restoration of the department of folk instruments at school started during the national-patriotic renaissance in our region. In September 1989 opened a pandora class, taught by People’s Artist of Ukraine, prof., Head of the department of folk instruments LNMA them. Lysenko L. Posikira. A. We worked in the department planned, A. Bazarnyk. Over the past decade, gained prizes in various national and international competitions: N. Kovaleva, N. Tsyhylyk O. Kushnir, T. K., N. Daniel N. Boruh, Yu Kolonohova, B. Baglai, N. Stepanyak, X . Yurchushun, Sozansky K., K. Trachuk. The base ensemble practice of senior department student is Bandura Ensemble (headed. C. Kutepov). The team regularly takes part in the concert life of the school and the city, performing at various venues on the occasion vidznachennya.derzhavnyh holidays. Students love – winners of national and international competitions: Sozansky A., A. Kopytko, A. Holubnychyy, P. Hilchenko, I. Sumaruk, R. Puneyko.